Once again, I go back to Zardosi School. 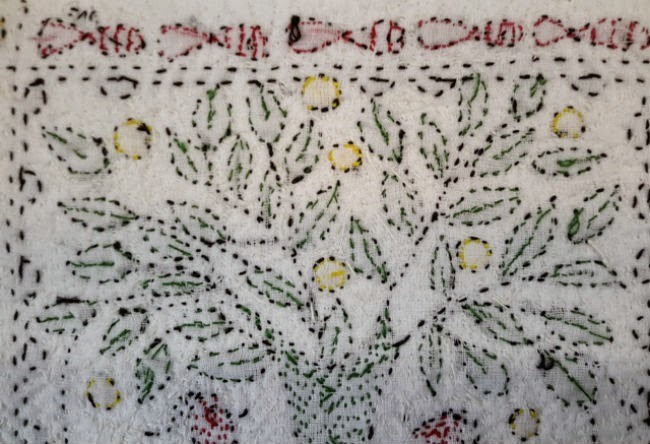 This time, for learning the embroidery technique from Bengal: Kantha. This technique consists in stitching (with a needle, not a hook) four layers of a thin fabric, the “mulmul”, a cheesecloth or gauze-like fabric. 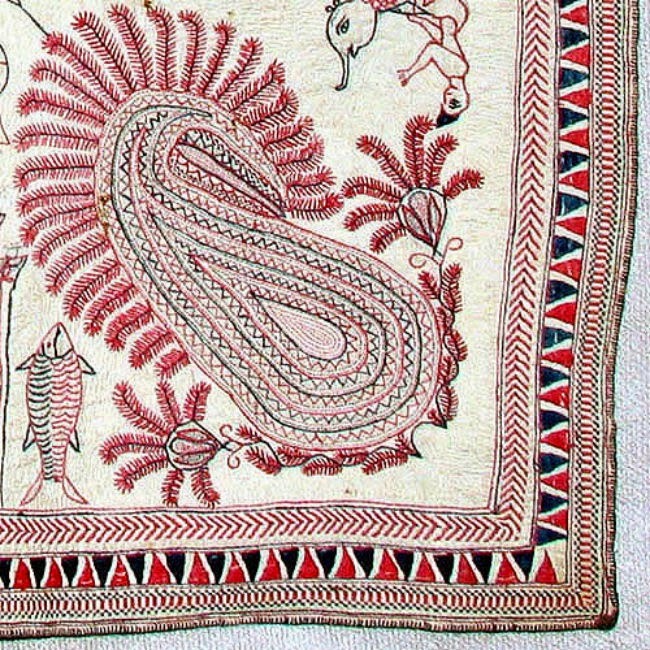 The Kantha Embroidery is an ancient technique developed by Buddhist Monks, in the 6th century. The monks recycled every worn out fabric available. By layering and stitching the pieces of fabric it was possible to solidify the pieces of fabric and to give them a second life. The tradition was to stitch small 4 X 4 in. squares, prettily embroidered for offering them in exchange of goods. Apparently, in 1498, Vasco de Gama brought back from India the Kantha technique. 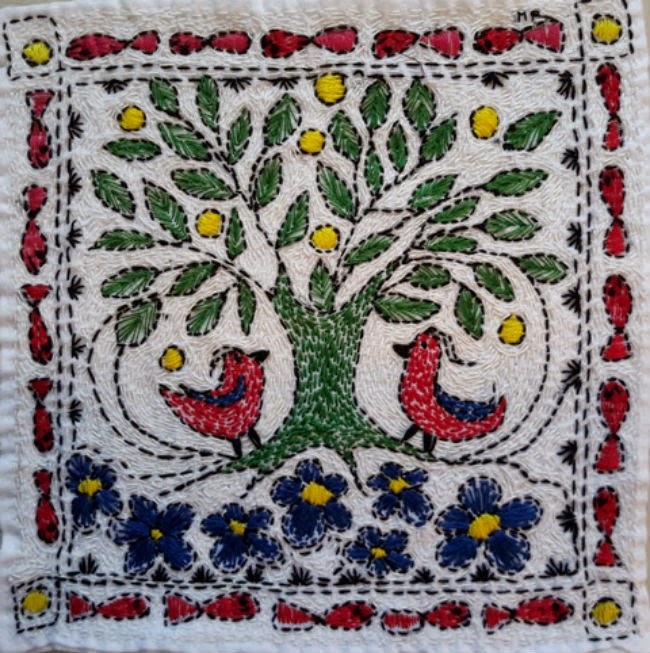 Therefore, in addition of spices’ cargo, Portugal discovered Kantha embroidery. 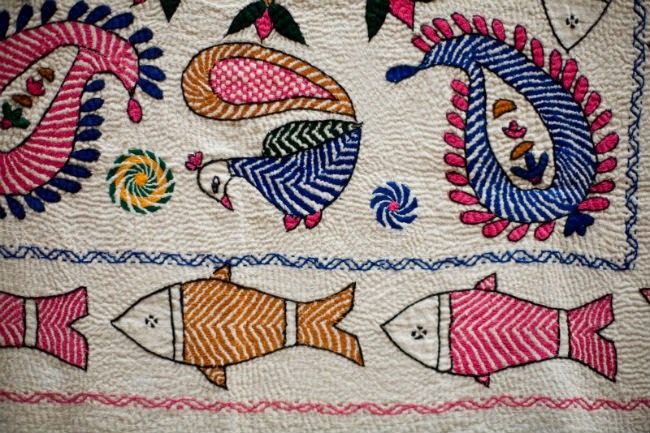 The Kantha technique gives an impression of great simplicity. Emerging from the general plainness (plain stitches, worn out fabric, a limited variety of colors) but can generate rich pieces of embroidery, true little wonders. 1. Four layers of cheesecloth that you “iron” with your hands, by this you smooth the fabric and the layers stick to one another. 2. No need for an embroidery hoop. Sitting down on the ground, the Indian embroiderers use their knees to help themselves to stabilize the embroidery project. 3. First of all, the piece’s hem is embroidered with running stitches. Only after that, the main design is stitched in the center of the square. Of course, during the process, little bumps and an uneven surface take shape, giving an appearance of padding. The motifs: The choice of the motif carries a message: a foliage motif means life; fish shapes mean a feeling of fullness, the classical Tree of Life symbol means wealth; and the whole range of Indian Gods could be added as themes. Often, in the center of the piece, a lotus flower is displayed, framed by geometrical patterns. The colors: Traditionally the chosen colors, for the main design, are: blue, yellow, red and green. Surrounding and underlining the central motif are concentric running stitches in white. There is a Buddhist philosophy behind this particular technique: we have to respect fully the work of the hands. We must not undo the too big stitches or the uneven sections, we have to respect the results as they are. Once a stitch is done, we do not rework it. I Iike this philosophy. Shika, my pretty Indian teacher, has taught the Kantha technique to many students through the years. But until now, no one has shown her Kantha project finished! After all, maybe the Kantha technique isn’t as easy as we think. What kind of challenge could be hidden behind those semi-sheer squares of fabric? So, until now no student has shown a finished project? Well, Shika, this is an interesting challenge for me. Will I finish my own Kantha piece?